To get a pre-purchase advice, you may post in the theme’s forum. To get a response more promptly, you are recommended to use our Ticket-system. We try to answer your questions within 1-10 hours. However, if any delay occurs, it doesn’t mean that we forgot about you. Some of the issues require testing and analyzing, so we can resolve it effectively. Please note! We do not provide support, if you do not have the purchase code. Support for third party software and plugins. Themerex technical support is always there to assist their users with all the technical questions regarding Themerex products. In the ‘Item Details’ there is a clickable banner “Support Sys”, which leads you to tickets. Or you may simply follow this link: themerex.ticksy.com. Enter your purchase key and register in the system. To avoid a confusion, please use your own ThemeForest login in Support System. Fill out the ticket form. Open the “downloads” tab in your account. Find our theme in the list of products. 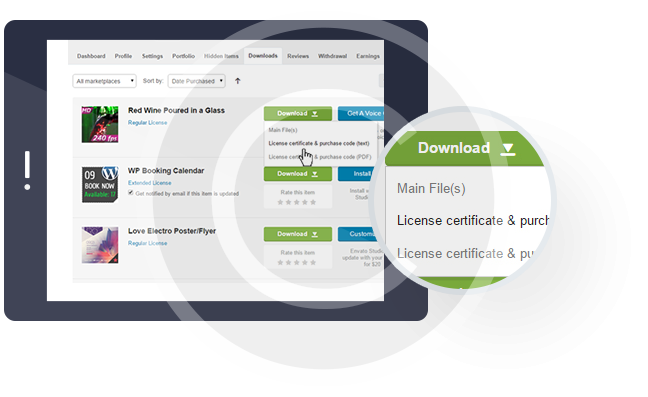 Click “download” button, and in the drop-down menu select “license certificate & purchase code”. Themerex offers only the best products and services and recommends them to their customers. One of the most important services is HOSTING. Unlike any cheap hostings that usually have limited resources which causes many problems to the site owners, quality hosting gives a client a fair amount of resources sufficient for any website and any task. By using quality hosting you can rest assured that your site will work smoothly. If you happen to use such hosting with limited resources (e.g. GoDaddy! ), you may experience issues with “one-click install” feature. In that case, you are always welcome to contact our support team to get qualified help. Get more than 30% discount on a hosting plan. Dont’t give up the time! Purchase now our theme! Everything you need to build an excellent website. Welcome to one of most relaxing salons, where our therapists offer tranquility whilst being treated.